Gift baskets are a unique way to send a message, whether for an anniversary, a birthday, etc. 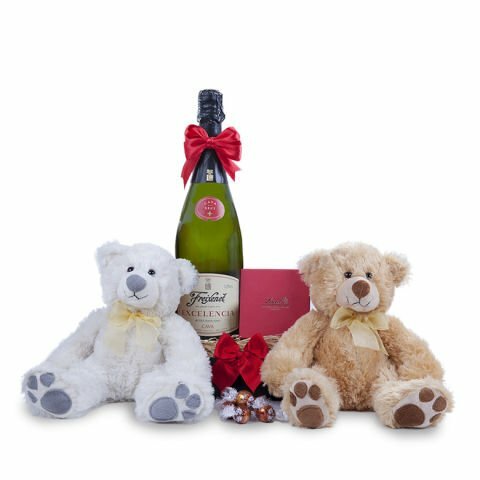 This basket contains exquisite chocolates, two teddy bears and a bottle of sparkling wine, a perfect set to make someone really special smile. Two adorable teddy bears, each measuring 35 cm. One bottle of the exclusive Freixenet Cava Excelencia Brut sparkling wine. 750ml. Creamy Lindt hazelnut chocolates, presented in an original 150g gift box. After spending ages searching for the perfect way to make someone special really happy, you must be delighted to have found this gift combination. Clearly there is no better way to put on smile on someone's face than chocolates, cava and teddy bears! It is the perfect expression of affection. Here's a toast to happiness!